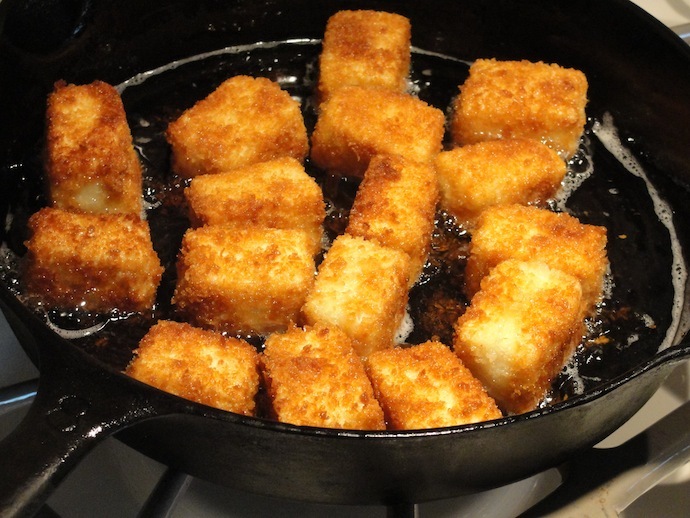 Fried panko tofu cubes. I make mine about half the size of these ones. We’re starting the segue into “cleaning out the fridge” mode this week, trying to use up everything we have on hand before we leave for Japan. A few things can be put into the freezer while we’re gone, but most everything else that’s in the refrigerator now, other than condiments, will have to be eaten. The goal is to leave the refrigerator as empty as possible when we leave mid March. We have one package of tofu left, and I’m looking forward to having the fried panko tofu cubes again this week. They were a big hit the last time we had them – the outside is nice and crispy, and the tofu inside becomes very creamy when cooked. Our dipping sauces will include teriyaki, barbecue, Thai spicy mango, Bulldog (Japanese-style Worchester sauce) and one of YaYu’s hot sauces. I might put out some catsup too. 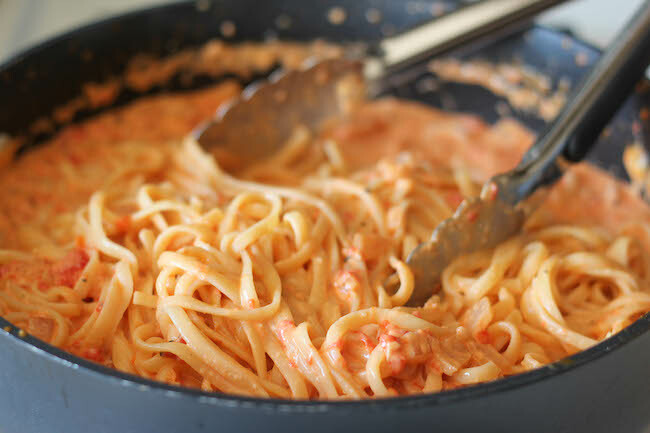 By the way, the creamy red pepper alfredo sauce that YaYu made last week was AMAZING. Thank goodness we doubled the recipe, because I could sit and eat it with a spoon right out of the pan. I’ve been enjoying it on eggs, over leftover meatloaf, and with roasted vegetables. YUM! 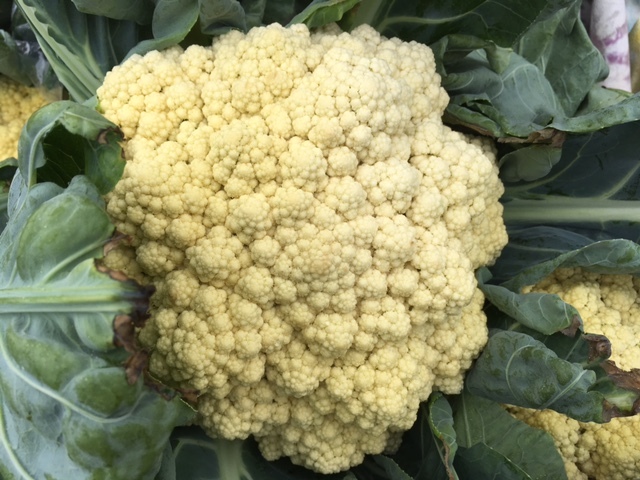 Purchases at the farmers’ market this week will be minimal, even if there are still tempting things to be found, like cauliflower and broccoli. Looking at the list all I can see that we have to buy is zucchini,but we will also probably also buy some papayas, bananas and bok choy as those will definitely get eaten before we go. 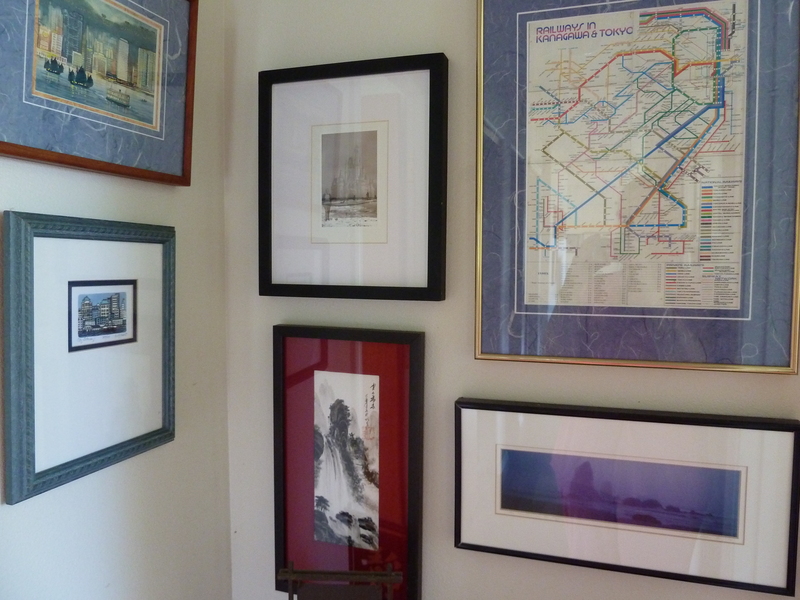 A corner of our travel wall collection includes a small watercolor of the Hong Kong harbor; a tiny print of the Seattle skyline; a postcard from Walt Disney World; a traditional Chinese landscape from the Forbidden City; a photo of the Oregon coast; and the Tokyo train and subway map I carried everywhere for 3 1/2 years during our last tour in Japan. The Chinese picture was created by a man using just the side of his hand – no fingers or brushes. It’s fun, and almost expected when you travel to find something to remind you of the good times you enjoyed, or to share a little of your experience with those back home. The best souvenirs can’t be seen or touched or heard. They’re the memories created during the journey, and the experiences shared with others. Your own photos make absolutely fabulous souvenirs. 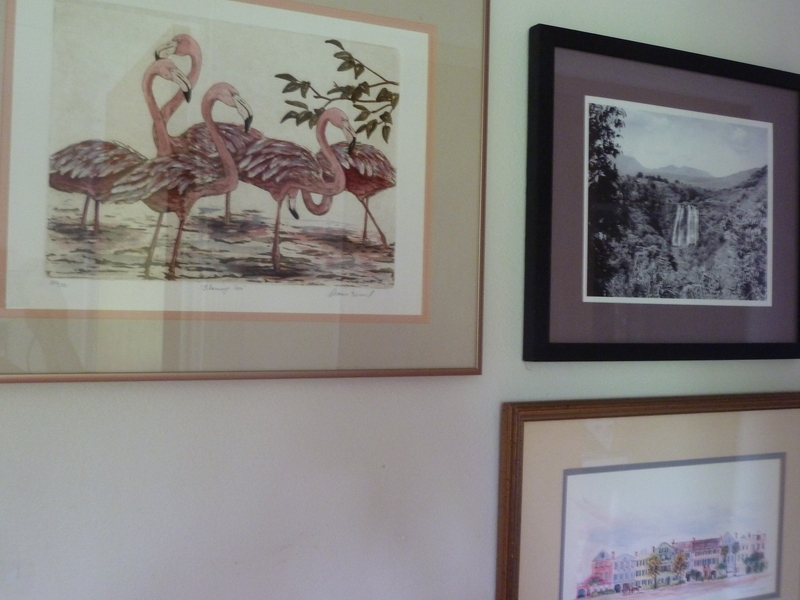 More of our travel collection: Flamingo print from our time in Key West; a vintage photo of Opaekaa Falls on Kaua’i; and “Rainbow Row” in Charleston, South Carolina. We always have a budgeted amount for souvenirs and we stick to it. I know I’ve felt disappointed that I couldn’t buy something because it would either blow up the budget or put us over or mean I couldn’t get something else I had my eye on, but in hindsight I have absolutely no regrets about anything I didn’t get to buy. I don’t even remember what those things were. A useful souvenir is always best. So, no totchkes or knickknacks for us. Brett and I have often bought coffee cups from cities we’ve visited (yeah Starbucks!) that we use for our daily coffee. On my most recent trips to Japan I bought several tenugui, cotton hand towels that are printed with amazing designs, from traditional Japanese themes to the avant-garde. These towels get used daily in our kitchen, and seeing them provides wonderful reminders of when and where I bought them. I also look for things I can use in the kitchen – these items are usually affordable and connect me to a place and time whenever I use them. I’m still using the spoon rest I bought 36+ years ago when we were in Coronado for Brett to attend training, and I love the handmade bamboo spatulas I scored when we visited Kyoto two years ago. Local food makes a fabulous souvenir. Food items are not as permanent a souvenir as a coffee mug or kitchen towel, but they can help draw out the experience and memories as long as they last. And, food items are usually very affordable. We brought home an amazing selection of sauces and snacks from our last trip to Japan, including all those interesting flavors of KitKats, and Brett brought back a bucket of delicious and much appreciated Danish butter cookies from his visit to Solvang in 2015 (those did not last long at all). We’re planning to send WenYu and Meiling each a box of their favorite Japanese snacks following our upcoming trip. Clothing items, carefully chosen, are also good souvenirs. I don’t do the t-shirt thing, but Brett came home from his 2015 California trip with a nice collection of shirts from places he visited – they get a lot of wear. Sweatshirts we purchased on Disney World visits when the girls were little were were worn by all three girls before they wore out – we more than got our money’s worth out of them. Finally, we used to always look for a picture to add to our travel wall. 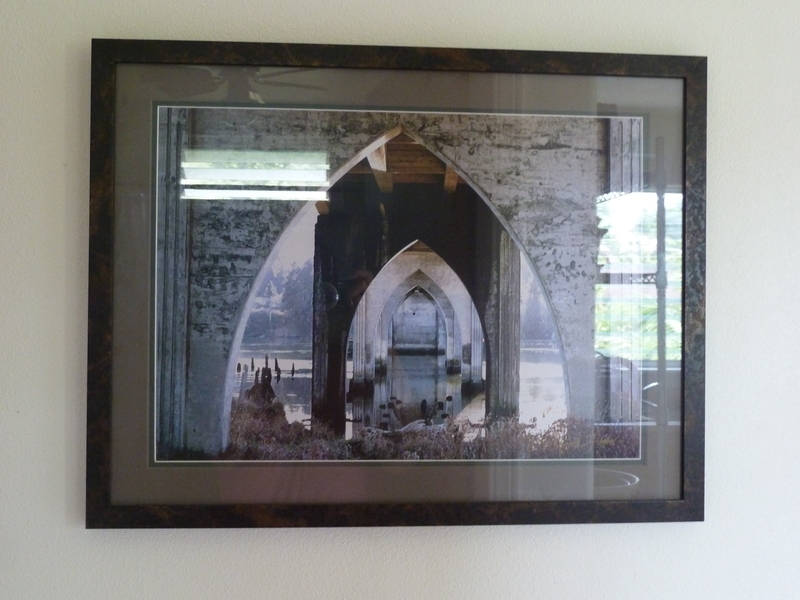 We started our collection back when Brett was in the navy, for reminders of places we were stationed or visited. We continued the tradition after he retired, and bought a few more, although these days we’re trying not to add to our possessions. We treasure every piece of our collection and every memory they recall. For example, the worn and broken creases in the folds of my Japanese train map remind me of the many times I pulled that map out and poured over it to find my way around Tokyo. The little watercolor of Hong Kong was purchased one evening from a street vendor in Kowloon, as Brett and I walked back to our hotel after dinner. 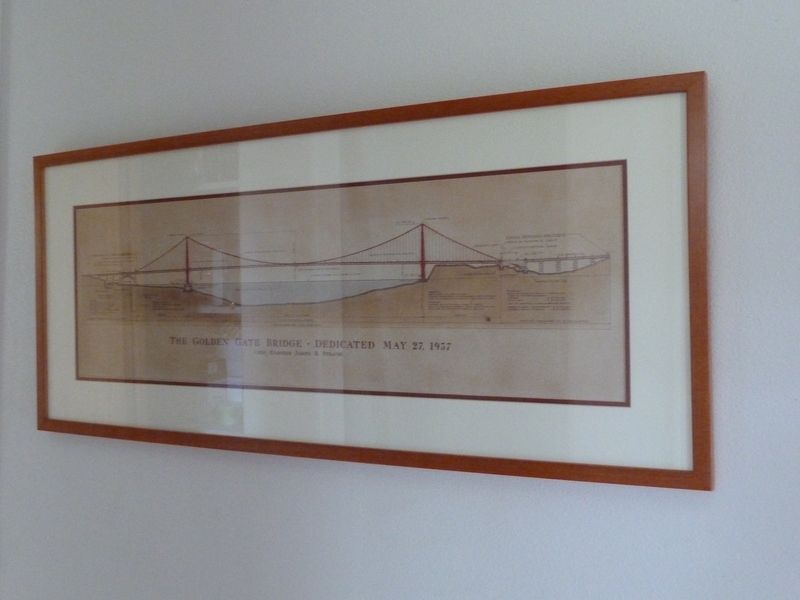 The picture of the Golden Gate Bridge was from our trip to San Francisco for our 25th wedding anniversary, purchased on the day we decided to adopt one more time (to add YaYu to our family). Every one of the pictures is uniquely special to us. Cross section of the Golden Gate bridge. The combination of kids and souvenirs can be both tricky and trying. Kids love stuff, and sometimes it seems they want you to buy them everything they set their eyes on. Our solution has been to give each child a set amount of spending money the first day of travel (to be added to whatever they have saved on their own and want to bring along). They can do whatever they want with the money we give them, buy whatever they want whenever they want. But . . . they are not allowed to ask for any more money during the trip nor can they ask us to buy something for them, including snacks. We started all of them out with this at a fairly young age, around five years old. Typically there was a quick, impulsive purchase that was almost instantly regretted when they saw how quickly their money dwindled, but for the rest of that vacation and future ones every purchase was carefully considered, even when they were just five or six years old. This system even worked at Disney World, where there’s a souvenir store every couple of feet and more temptation than can be counted. More often than not, all four of our children usually have/had money left over at the end of each trip. On our trip to Japan in 2015, YaYu bought very little, then saved up a bit more after she got home and bought herself a new (inexpensive) computer – totally her choice of what to do with the money we gave her for the trip. With this system, Brett and I have found ourselves able to enjoy our time with the kids and not feel like cash registers or pressured to buy, buy, buy when we travel. The kids like the system too, and the control they have over their purchases. The underside of the US 101 bridge in Florence, Oregon. We camped with other adoptive families in Florence every summer for over 10 years. Souvenirs are an intensely personal and usually fun part of any travel experience, and whether they’re a planned purchase or a spontaneous find, you don’t have to break your travel budget in order to bring home something special from a memorable journey. What do you like to buy when you travel? How do you handle souvenir shopping? What’s your most treasured souvenir? Well guess what? After a month of very limited carbohydrates, increased exercise and lots of water (and possibly a round of food poisoning), I’ve lost some weight! 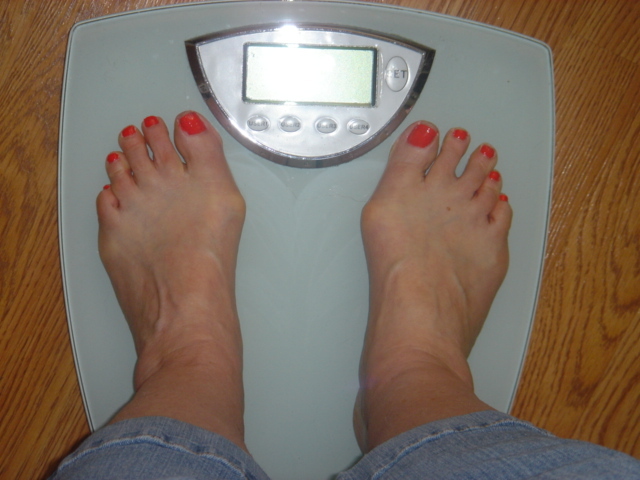 I did an “official” monthly weigh-in yesterday morning, and this past month I lost eight pounds! Eight pounds!! I could tell I was losing something because my clothes have felt different, but it was a nice surprise to see so much come off. I sure don’t expect to lose this much every month, but it’s a good start, and I sure haven’t felt deprived in the least. YaYu saw the doctor this past week for some breathing difficulties she’s been experiencing, and like her two sisters before her has for the time being been diagnosed with exercise-induced asthma and prescribed an inhaler. The doctor has also ordered a pulmonary function test to rule out general asthma, and until that happens she can’t participate in any running events for track, although she can still compete in both the long jump and triple jump events. Exercise-induced asthma for teen athletes is more common here than one might imagine, possibly caused by a combination of heat, humidity and dust in the air. We received the invoice for the Key Club convention that YaYu will be attending in April: $325 per person. However, after all the fundraising she has done the past few months, her balance due was just $12.20! She is still continuing to sell candy bars, although the money going forward will go toward reducing her airfare to Oahu and back. Reading: It’s been slow going with Nobody’s Fool so far, although I am enjoying it. I’m finding myself overly distracted by the news once again, so am going to have to knock that back some and focus more on reading. Listening to: It’s a very quiet morning here. The sun is out, but the only sound outside is birds singing (and the occasional rooster). YaYu is still asleep – she had a long day yesterday – and Brett is reading. Watching: Brett and I just started Season 3 of Ripper Street, still watching just one episode an evening. 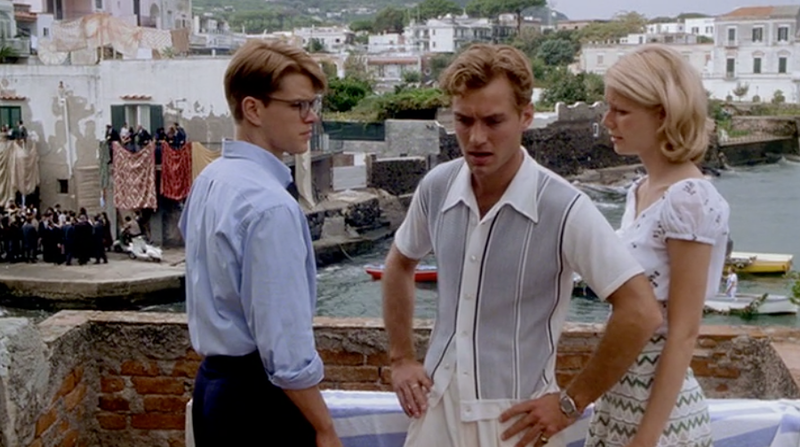 On Friday evening we all watched The Talented Mr. Ripley, courtesy of Amazon Prime. Still a great story, and terrific acting from everyone in the film (and a reminder once again of the talent lost when Philip Seymour Hoffman died). We noticed that there are new episodes available of the Great British Baking Show on Amazon Prime, so we’re going to take a break from Ripper Street starting tonight to watch that for a few days. Cooking/baking: I’m making an orange cake this afternoon for Brett and YaYu (Brett’s choice), and tonight we’re having Chinese stir-fried tomatoes and eggs again. We raved over it when I first made it a couple of weeks ago and are excited to have it again along with sautéed bok choy. Besides being delicious, the egg dish is also a snap to prepare. The stadium market on Fridays is very low-key compared to our local market. 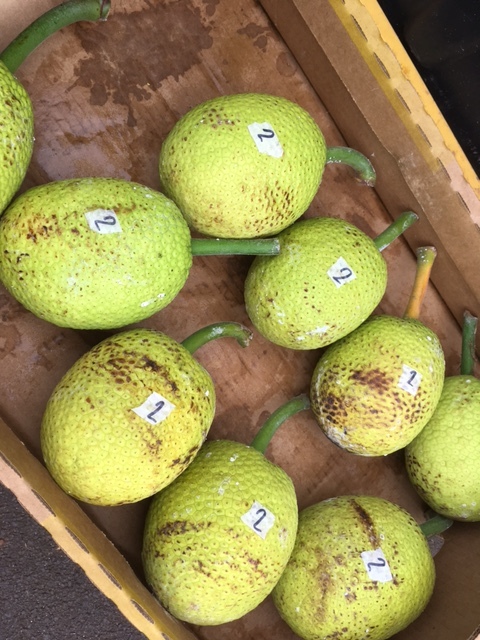 Happy I accomplished this week: I didn’t think we’d be going to a farmers’ market this week, but Brett and I headed down to the Friday afternoon one at Vidinha Stadium in Lihue, and bought enough to get us through until the Kapaa market next Wednesday. I cranked up my bike riding to three 15-minute sessions a day, and rode over 105 miles, and burned over 3,880 calories! I also drank all my water (and then some), and did all my Japanese and Portuguese study sessions. As of tomorrow though I’m changing the time spent on each language: I’m cutting back the Japanese to 20 minutes, and increasing Portuguese to 20 minutes each day. It’s not my accomplishment, but Brett got WenYu’s taxes done – they were complicated because she worked in both Hawaii and Massachusetts last year. She’ll be getting back a nice refund this year from both states as well as from the federal return. Looking forward to next week: Brett and I plan to head down to the south side of the island either Tuesday or Wednesday to visit Hanapepe. There’s lots to see and do in Old Town, and we’ll have lunch while we’re there. We’re also planning to finish up gift shopping this week for our upcoming Japan trip. Thinking of good things that happened: Seeing that tiny amount due for YaYu’s convention payment just about blew us away – we thought, if we were lucky, that she might have raised maybe $200 or so. 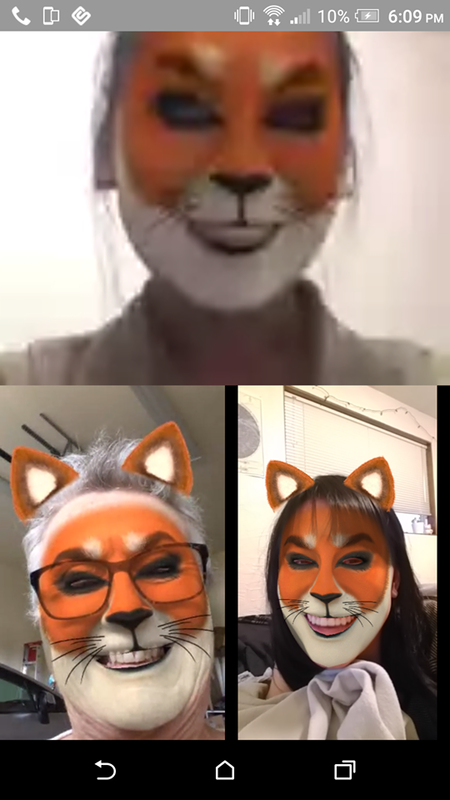 I had a very fun time chatting with Meiling and WenYu on a conference call yesterday – they showed me how to add filters while we talked which kept us laughing the whole time. We put $4.52 in the change/$1 bill jar this week. It was going to be nothing because we were heading for a no-spend week, but then ended up going to the farmers’ market on Friday and got some change back. Grateful for: Both Brett and I are so very thankful that YaYu has put so much effort into fundraising so that we don’t have to pay so much for all these activities she’s involved in. She is a “joiner,” and every thing seems to required some sort of payment these days, but she always tries to find a way to keep the cost down to zero, or as near to that as possible. Bonus question: Are you a risk taker or someone who’s more risk averse? I think I’m someone who falls right into the middle of those two things. I definitely not afraid to try something new or somewhat risky, but before I do I try to find out as much about what I’m getting myself into. This goes for everything, whether it’s bungee jumping, skydiving, or some major life decisions. 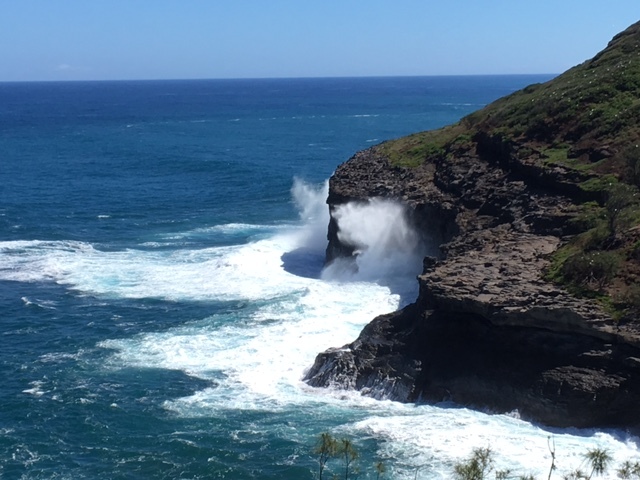 There are loads of people who would find moving to Hawai’i with three teenagers while living on a fixed income a very risky proposition, but we investigated our move thoroughly before we committed, and knew what we were taking on before making the move. Same for adopting three children in our mid- to late-40s and early 50s. We were risking our retirement when we did, but we weighed all the plusses and minuses, and knew it was the right thing for us to do. If I do think that something is too risky, or I learn of possible future pitfalls that I won’t be able to avoid, then I have no trouble pulling back or backing out from something. That’s what’s been going on this week at Casa Aloha. How was your week? What have you been up to? What good things happened for you? Costco’s $4.99 rotisserie chickens are the best deal in the store, and they’re delicious! Brett packs YaYu’s lunch every day in her washable lunch bag, along with a cloth napkin and stainless utensils (if needed) we bought at Goodwill. She takes a stainless steel Thermos for hot foods, and everything else in stainless steel or Pyrex containers. Zero waste. We buy a $4.99 Costco chicken every month, and get at least four meals from it. Last week we had a roast chicken dinner, Asian chopped salad with chicken, leftover cold chicken for dinner on leftovers night, and chicken salad (sandwiches for Brett and YaYu, just salad for me). The bones went into the freezer and will be used to make chicken noodle soup later. We do all of our weekly laundry on Sunday, three loads of it, and hang approximately a third to half of it to dry outside. Two of the three loads are done in cold water; the whites get washed in warm. Otherwise during the week the washer and dryer are not used. Brett (and WenYu, when she’s home) always takes ‘navy’ showers: get wet, turn off water, lather up, then turn on the water again to rinse off. YaYu and I, on the other hand, are masters of efficient five-minute showers. Both techniques help keep our water bill down each month, especially when we have to run the sprinklers. We wash out, dry and reuse all Ziploc bags (unless they contained meat or cheese – the bags get greasy), and the plastic bags from the farmers’ market, Costco and Big Save. What frugal habits have you developed to help you save? I am always open to learning new ways! 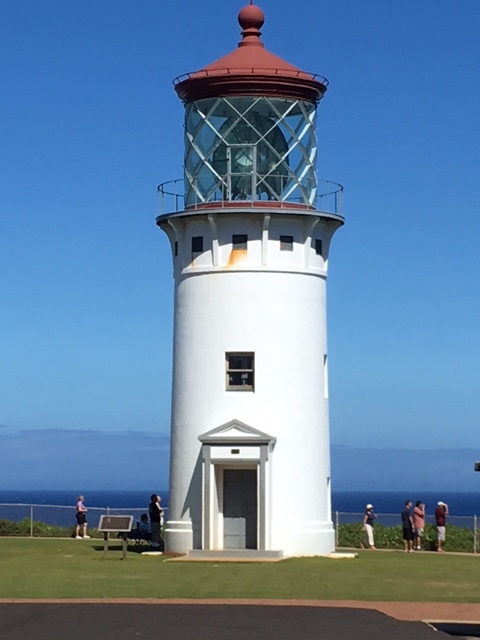 About two miles, six or seven minutes, off Kuhio Highway (56) at Kilauea lies Kilauea Point National Wildlife Refuge, which is home to the Kilauea Point Lighthouse, as well as sea birds and marine life. When Laura and I arrived at around 11:00 a.m. on Valentine’s Day we were greeted by the sign below and two people directing traffic suggesting we come back in the afternoon because there was no parking (you cannot enter the refuge on foot). However, after about a five minute wait, several cars came out and we were able to enter the Refuge. While we waited, we wandered over to the fence and watched nesting red-footed boobies, soaring Laysan Albatross, some lolling sea turtles, and even a couple of humpback whales. However, neither of us have the sort of camera that allows us to capture credible shots of turtles and whales—all we get are brownish gray spots. The only good photos from the fence were of pounding surf the and the red-footed booby community (those white spots in the brush) above the cliffs. One of the first and most important signs before you even enter the refuge is this one: Do Not Feed Wildlife! No, the wildlife here won’t rip off the top of your car to get at your stuff, but if you are inclined to toss them a treat, you shouldn’t. 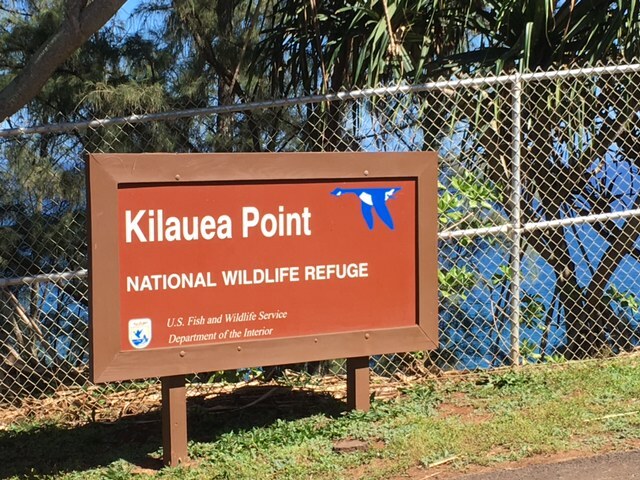 We first visited the refuge while vacationing here in 2012, but since moving to Hawaii Laura and I seem to have found a thousand reasons (excuses) not to go beyond Kong Lung Market in Kilauea, which is only a mile-and-a-half from Kilauea Point. 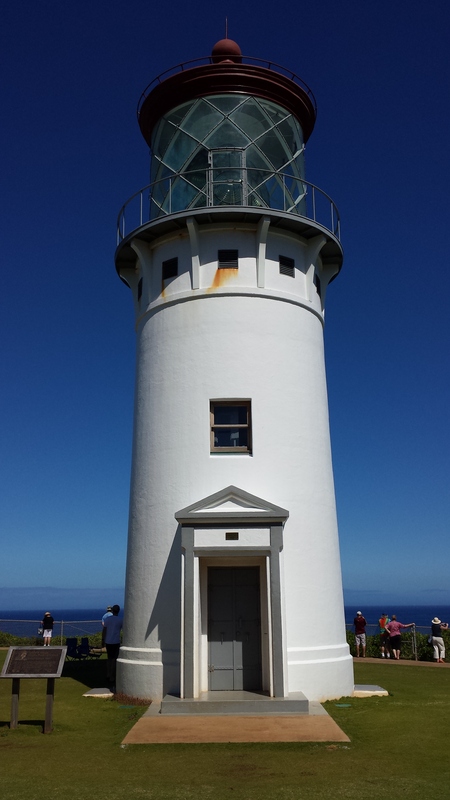 However, since our first visit the lighthouse has undergone renovations, and reopened with the name of late Senator Daniel K. Inouye appended to its name. Shortly before moving to Hawai’i, we had purchased a lifetime Access Pass for U.S. National Parks and Recreation Lands which turned out to be valid for our admission to the refuge (otherwise $5 each), and since the Valentine’s Day weather was positively gorgeous, off we went. Following restoration, the lighthouse’s lens still can cast a beam but does not rotate because the bearing that allowed rotation consisted of an open trough containing 260 gallons of mercury. Nevertheless, the 8,000-pound fresnel lens is impressive. 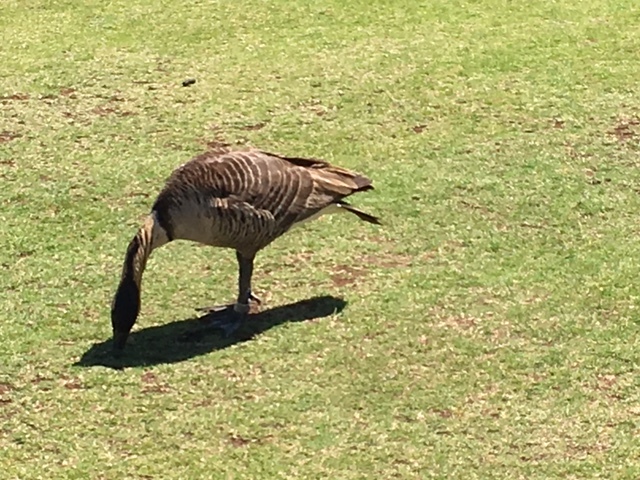 Among the endangered species, the nēnē (Hawaiian goose, and state bird) was the first to greet us on the lawn in front of the lighthouse. The number of nēnē was once down to 40 throughout the Hawaiian Islands and within the refuge, but the numbers now grow every year. This cunning nēnē totally ignored all the visitors and continued grubbing for insects and shoots throughout our entire visit. 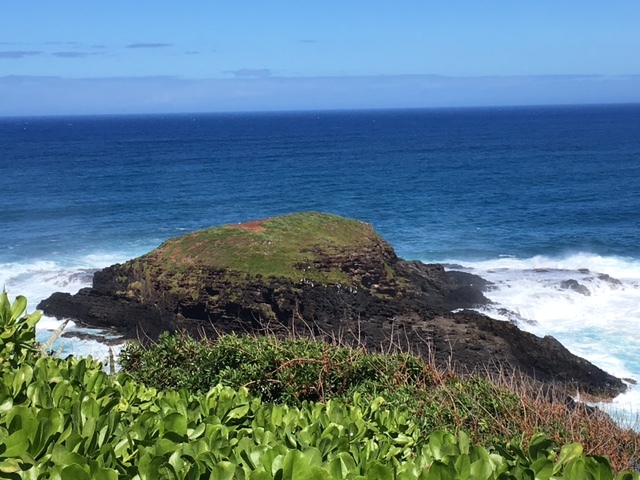 There is an island, Moku‘ae‘ae (‘fine small island’), just off the end of Kilauea Point that supports its own colony of sea birds, which you can see dotting the rim in the photo below. To a certain extent, this rocky outcrop protects the point itself from the punishing waves. Although we witnessed it twice, we weren’t fortunate enough to capture a video of the islet’s impressive water spout. It’s well worth the wait for a look and listen of the spout. Looking to the west (your right as you exit), you get a splendid view of Kauai’s entire North Shore, from Secret Beach to Makana (‘the gift’), aka ‘Bali Hai,’ and Ke‘e Beach. 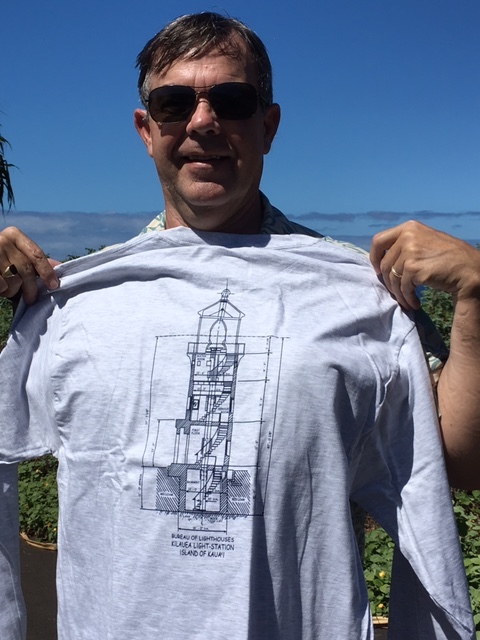 Before returning to our car, we stopped into the gift shop to refresh my wardrobe because my 2012 lighthouse shirt is no more – I wore it out. Just like that archival moment when a child gets their first driver’s license, my new Kilauea Point Lighthouse shirt is preserved for posterity. 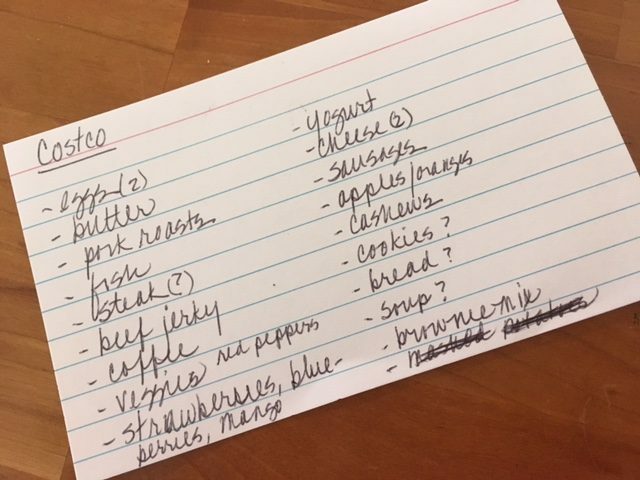 This week’s menu was slightly more difficult than it typically is for the unusual reason that right now our fridge, freezer and pantry contain an embarrassment of riches, almost like we have too much food, and therefore too many choices. I go through this every month right after we do our Costco shop – there is almost too much to choose from, or at least it seems that way. Definitely a first world problem, I know. Creating a menu when there are so many choices uses a somewhat different thought process than when supplies and choices are more limited. First of all, it requires less creativity. But still, there are questions such as: What should be used first? Will this or that be more useful later in the month? YaYu asked if she could make dinner on Friday – she found the recipe for vegetarian red pepper alfredo sauce online and wants to try it. She doesn’t know yet if she’ll be able make the fettucine from scratch – it will depend on how late track and tennis practice finish. We have everything we need on hand, so no trips to the store this week. 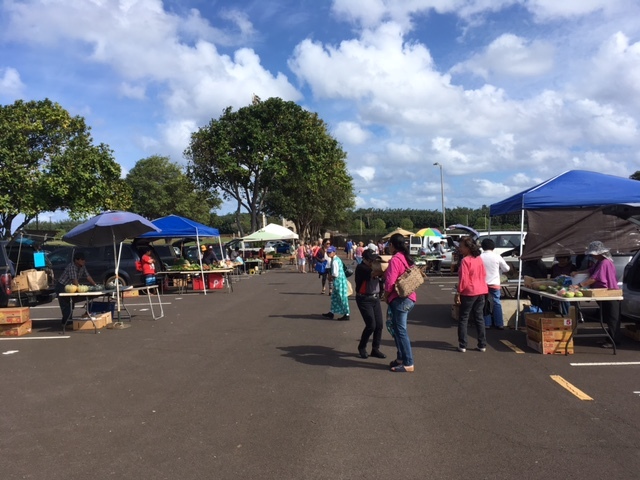 We won’t be able to go to the Kapaa market on Wednesday, but Brett and I have decided we will try to head down to the Friday farmers’ market at the stadium. 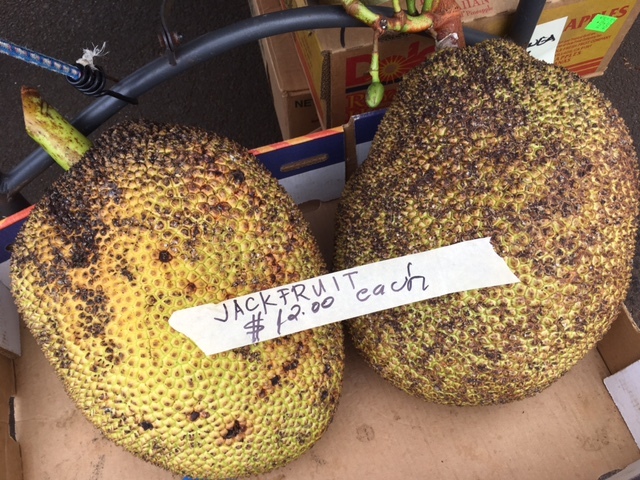 It’s a small market, but they have good prices and we should be able to get papayas and bananas there, and maybe find a few other things. 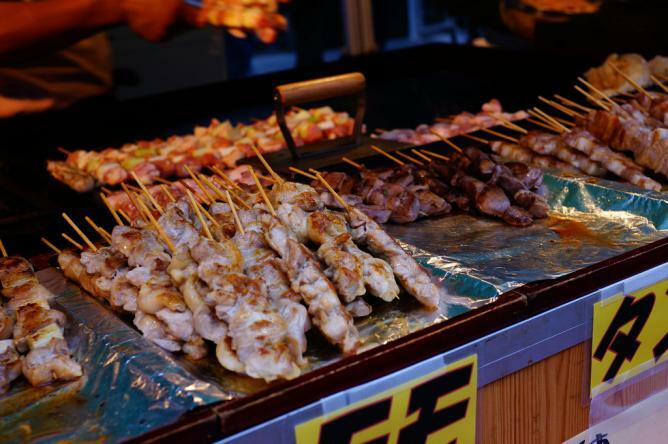 The aroma from an outdoor yakitori stand takes me right back to my first visit to Japan, when I was 18 years old, and visiting Inokashira Park in Kichijoji. There was a stand right outside the entrance to the park, and the smell was intoxicating. The yakitori was pretty tasty too. Believe it or not, some of the most intense and lasting memories we have come from the aromas we encounter when we travel. Sadly, most of us tend to disregard the impressions we receive from our sense of smell when we travel, and instead concentrate more on taking pictures or buying souvenirs to remind us of our journeys. And yet, our sense of smell has the ability to repay the the encounters we have with scents and aromas many times over. Experiencing a particular scent after we return home, or in a different location, has the power to transport us to both a place and time, pleasant or unpleasant, filling our minds again with what we were hearing, seeing and feeling when we inhaled that aroma. It’s the same way the scent of bread baking or other foods cooking can take us back to our grandmother’s kitchen, or the scent of freshly mowed grass can bring back memories of a park we visited or games we played as children. The scent of green tea always reminds me of tea shops in Japan and China. They were calming, comforting and quiet places, even in the busiest of cities. Barbecue – The aroma of smoky barbecue still takes me back to a little shack called The Brown Pig, which sold the most amazing barbecue in Millington, Tennessee. I craved it when I was pregnant. Whenever I walk past a tatami shop in Japan, and smell the fresh mats, I’m transported right back inside our off-base Japanese house, where we lived for 18 months in 1990-1991. 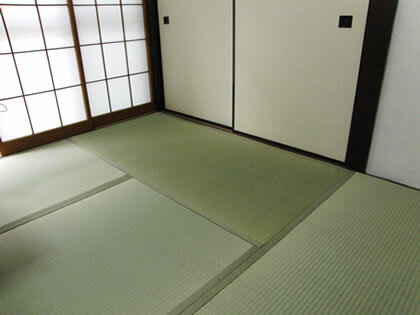 We had fresh tatami in our dining room and bedroom – heavenly! The tang of ocean air and the aroma of sunscreen always remind me of childhood summers spent at our family’s San Clemente beach house. The scent of Tiger Balm and White Flower Embrocation always puts me in Hong Kong, having to stay in my hotel room with a very, very bad cold and watching a man across the road practice some kind of martial art on the top of his building. 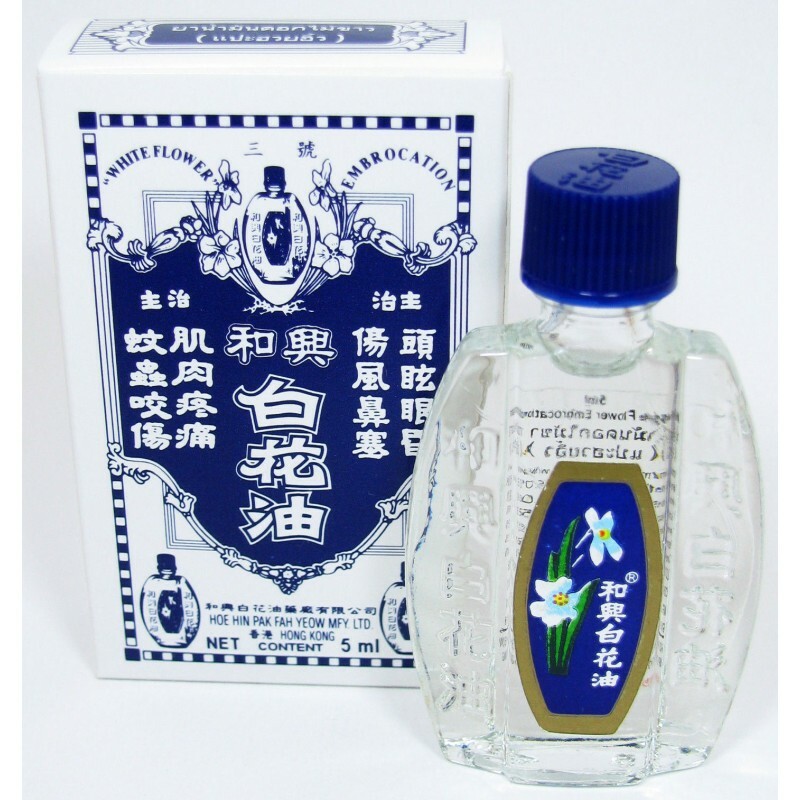 I still use White Flower – it works! The smells we encounter when we’re on the road are perhaps our most intense travel experiences, even if we don’t recognize them as such, or pay much attention to them at the time. While a picture can remind us of where we’ve been and what we’ve done, a remembered aroma can put us right back inside a memorable experience. The view looking south from Kilauea Point, where big swells were breaking against the rocks. You can’t see them, but the hill is actually covered with white red-footed boobys. We had another lovely week here at Casa Aloha, with Valentine’s Day turning into something special. I gave Brett and YaYu each a box of See’s chocolates (the best! ), and Brett gave me a small bouquet of roses – very unexpected and sweet. We usually don’t do anything celebrate or mark the day, so this year turned out to be a nice surprise for all of us. 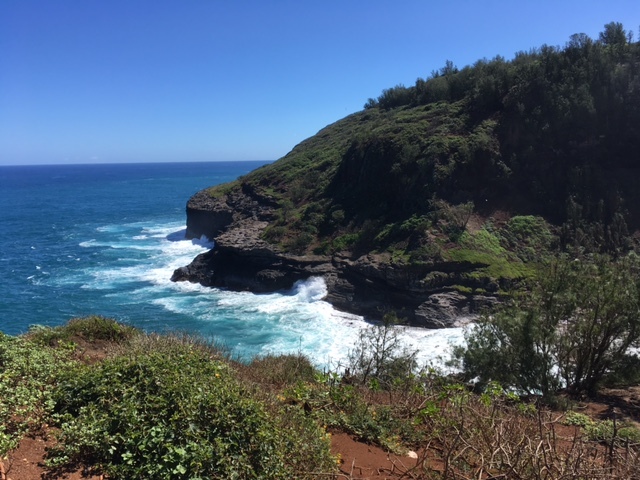 The day itself was glorious, so Brett and I headed back up to Kilauea to visit the National Wildlife Sanctuary (admission free with our senior lifetime National Park pass). We almost didn’t get in because there were so many visitors, but we decided to wait and see what happened and within a few minutes a few cars came out and we were allowed to drive in. 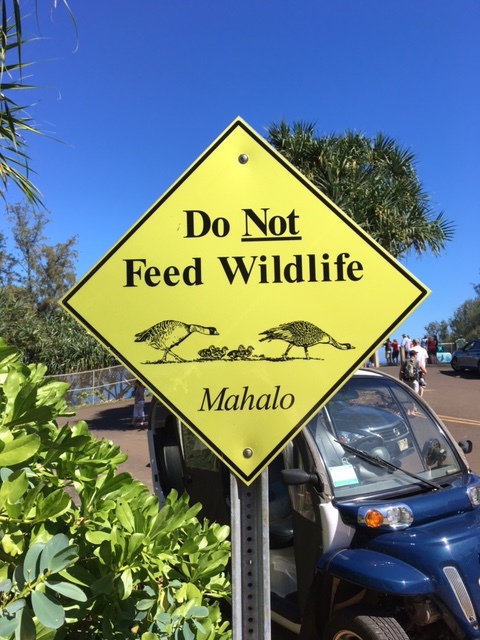 We saw more wildlife than we thought we might, including several whales, nene (Hawaiian geese), and other shorebirds. The views were nothing short of spectacular. We found out this past week that YaYu has to attend a mandatory four-day orientation on Oahu in June for her China trip this summer. We called the organization to say that we couldn’t afford the additional expense of four days on Oahu, but a homestay will be arranged for YaYu with another student who will be going on the trip. So, we will have to buy her a round-trip ticket over to Oahu and back, and pay a very small stipend to the family for breakfast and dinner, but we can fit those things into our budget by June. The total for all that beautiful produce we bought at last week’s farmers’ market was . . . $32! 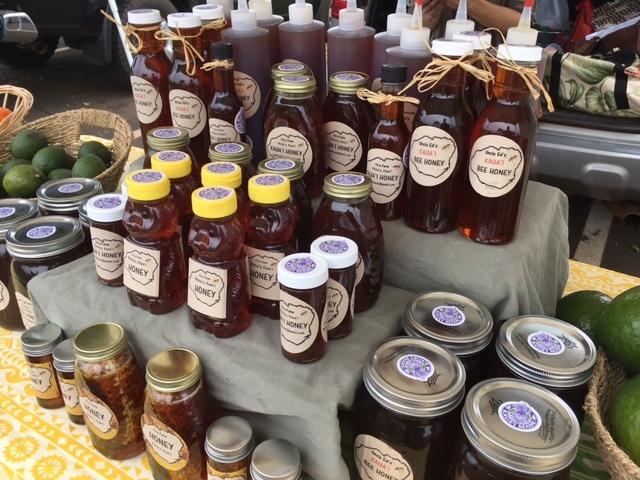 The most expensive item was the little jar of honey, which cost $5. 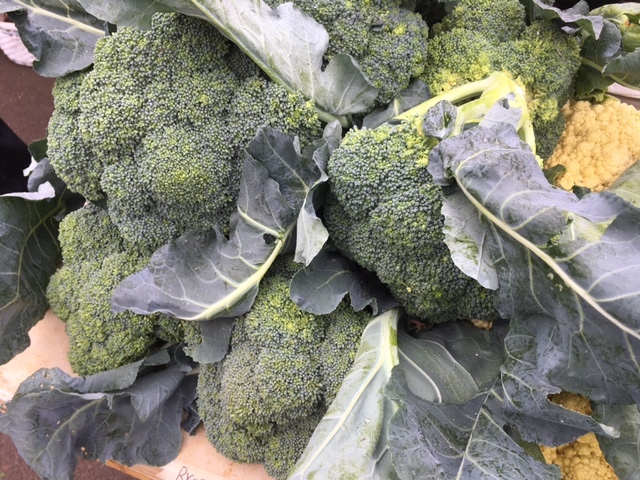 The big head of broccoli was $4; the tomatoes and bunch of bananas were $3 each; the small head of cauliflower, bok choy, Swiss chard, zucchini and cilantro were $2 each; and the cucumber was $1. 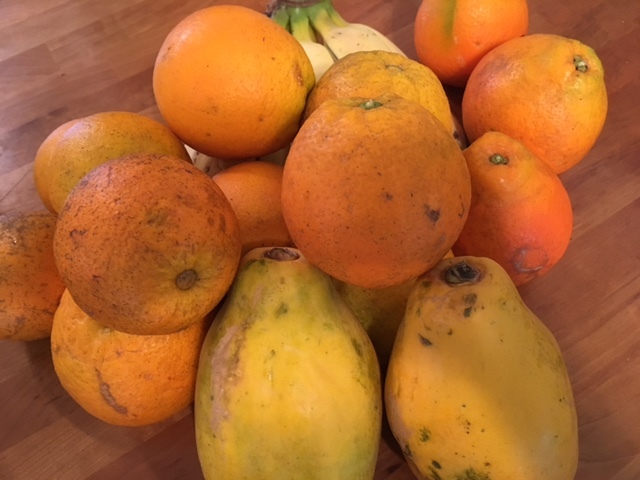 The two papayas cost $4, and all the oranges and tangelos together were just $2. We won’t be going to the market this week as YaYu has a doctor’s appointment up in Kilauea at the same time, but we’ve got enough to get us through next week. That head of broccoli is big enough for three meals! Reading: I finished Life As We Knew It on Friday, and am now reading Nobody’s Fool by Richard Russo. I’ve enjoyed everything he’s written, so am greatly looking forward to this book. Listening to: It’s very breezy outside today – the trees are making lots of noise. But, otherwise no outside noises, including roosters (yeah!). Inside it’s quiet except for the washer and dryer doing their thing. Watching: Brett and I continue to work our way through Ripper Street. In the past we’ve watched more than one episode of shows at a time, but are only allowing ourselves one an evening now, to stretch things out a bit. Friday evening we watched The Kingdom of Dreams and Madness, a documentary about famed animator Hiyao Miyazaki and Studio Ghibli. As we are all major Studio Ghibli fans here, this was especially interesting to us. Once again though, I could barely understand a word of Japanese – thank goodness for subtitles. Cooking/baking: We usually have eggs of some kind on Sunday evening, but because there’s no school tomorrow (President’s Day) YaYu is having a friend over this evening for dinner and a sleepover, and I’ve got the slow cooker carnitas going today and we’ll have tacos and rice this evening. I’m going to make a pan of brownies this afternoon for the girls to nosh on later. I made ginger sugar cookie dough yesterday evening, and baked the cookies this morning (the dough needs to be chilled before baking, the longer the better). Happy I accomplished this past week: Brett and I got all our food shopping done for the next month, and came in $20+ dollars under budget, so that’s money into the savings account. We lowered our food budget this year from $600 per month to $500, so to come in under is some serious saving. Hopefully we will get most of the food used up by the time we leave for Japan. I didn’t make it to the pool for a swim this past week, but on the days I couldn’t go I added in an additional session on the exercise bike. Otherwise I got in all my bike rides, even though were a couple of times I didn’t feel like it, drank all my water, and did my language studies. I am really disliking Rosetta Stone at this point, but just have four more lessons to go and I am done! Looking forward to next week: We really don’t have anything on the calendar next week other than YaYu’s doctor’s appointment, but the trade winds are supposed to be quite brisk, so not sure if Brett and I can make it to the beach or not. Thinking of good things that happened: YaYu had to attend a Kiwanis Dinner on Valentine’s Day, and she and a partner decided to take along some more of the chocolate bars they’ve been selling as a fundraiser. She and her partner sold 90 of them! YaYu has now almost completely covered the cost of her April trip through fundraising. She also worked yesterday afternoon to distribute the malasadas the swim team sold, and she a bag for all of us to share – I admit to having one (and it was divine). I must be losing weight though because a pair of pants I couldn’t put on at the end of last year went on easily when I tried this past week (but I’m holding off on officially weighing myself until the end of the month).We put $24.73 in our change/$1 bill jar this week. Grateful for: I am feeling very thankful that the staff at PAAC (Pacific and Asian Affairs Council) is working to make sure we can afford to send YaYu to the orientation in June by finding a homestay for her so that she can go on the planned trip to China. I can’t explain it in words, but I could really sense the spirit of aloha coming from the woman in Honolulu that I spoke with, that they will do everything they can for YaYu, and will look out for her as well. Bonus question: Which famous person, dead or alive, would you like most like to know? 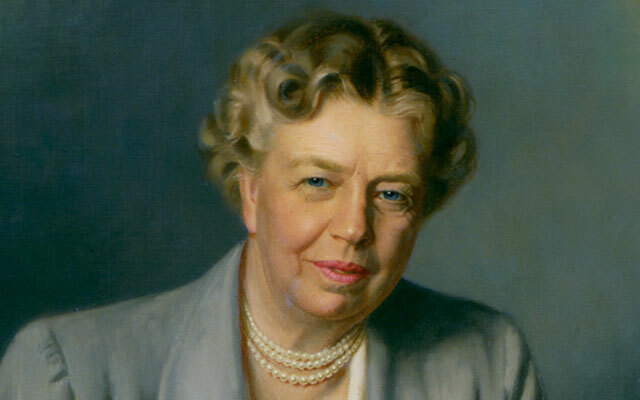 This required a bit of thought, but I honestly would love to have had the chance to know Eleanor Roosevelt. She overcame a very difficult childhood, infidelity in her marriage, the loss of a child, and jokes and taunts about her appearance to become a powerful, insightful First Lady who championed the rights of the underprivileged, and who later became a respected representative for our country to the United Nations. She also became “her own person,” secure in who she was and what she could accomplish, and did this in a time when women of her class were (other than during WWII) expected to stay home and tend to their house and family. She’s always been an inspiration and role model for me. That’s a wrap from Casa Aloha! How was your week? What good things happened for you? What are you doing this afternoon? Roasted baby carrots – yum! Rather than throw them out, I used the crushed Maui onion potato chips left in the bottom of a bag to top this week’s tuna casserole – very retro (and tasty)! 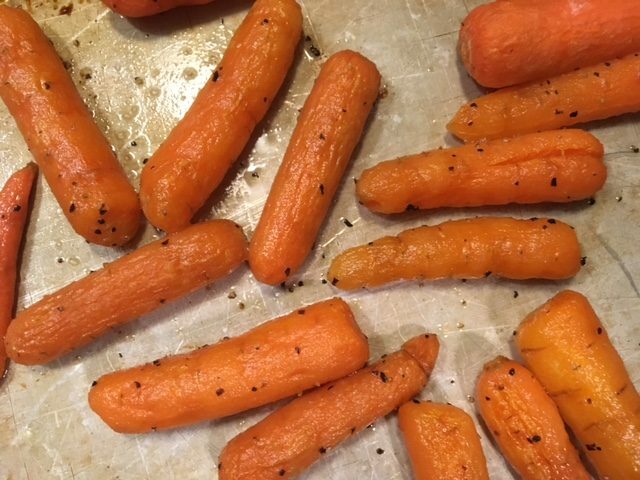 The remaining baby carrots in the big bag we bought at Costco last month were looking kind of sad, but I roasted them and served with our Valentine dinner this week. They were delicious! This month’s shopping list for Costco; Walmart and Big Save are on the back. The question marks are for items we’re not sure about based on price and/or availability. We made a list for our monthly big shop at Costco, WalMart and Big Save. We always shop with a list, and if something’s not on the list we don’t buy it. This year’s rebate check from Costco was $144.47. A matching amount was transferred into our travel savings from our grocery budget. I listed a full-size bedspread and matching pillow shams, and my blue Chantal roasting pan (that I won as a sales incentive), on Craigslist. We need neither of them. What frugal things did you do this past week? 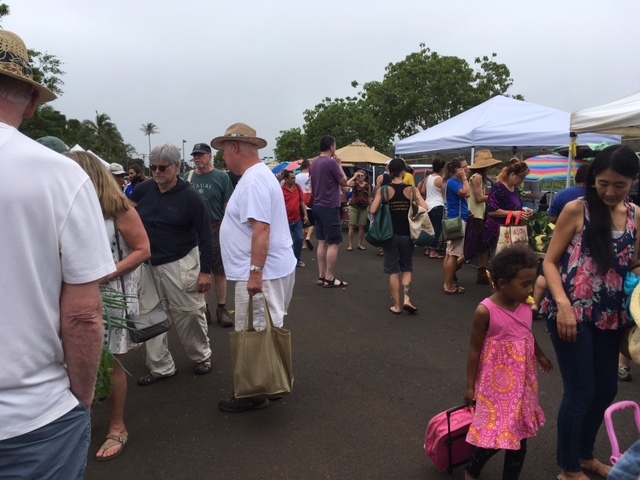 Kapaa Farmers’ Market: How Much Did We Spend? It was cool and drizzly yesterday, so market crowds were larger than usual. If the weather’s good there are fewer tourists – they head to the beach! 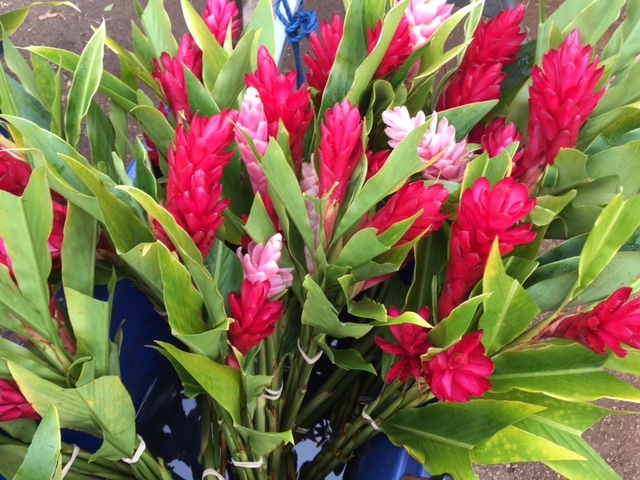 Every Wednesday afternoon Brett and I get ourselves down to the Kapaa Farmers’ Market, located in the parking lot near the New Town Park. 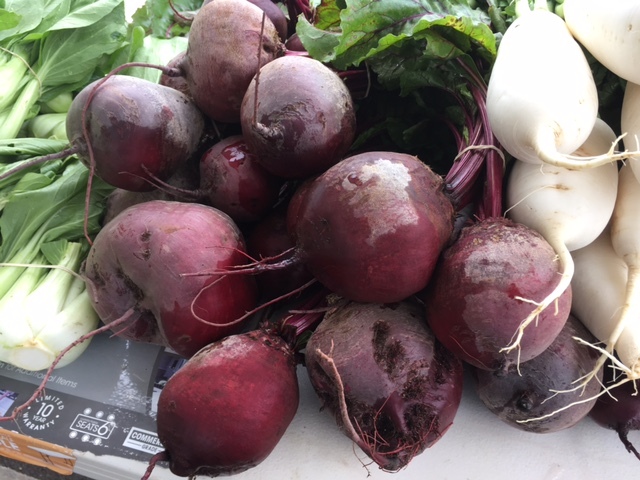 The market begins at 3:00 sharp with the blowing of a whistle (with no buying or selling allowed before the whistle), but we always like to be there a little bit early so we can scope out what’s available and how much it we can afford. We always go with a list, but are open to buying other things if we see something we like and can eat in the coming week, and if the price is right. The last few weeks at the market have been frankly amazing. 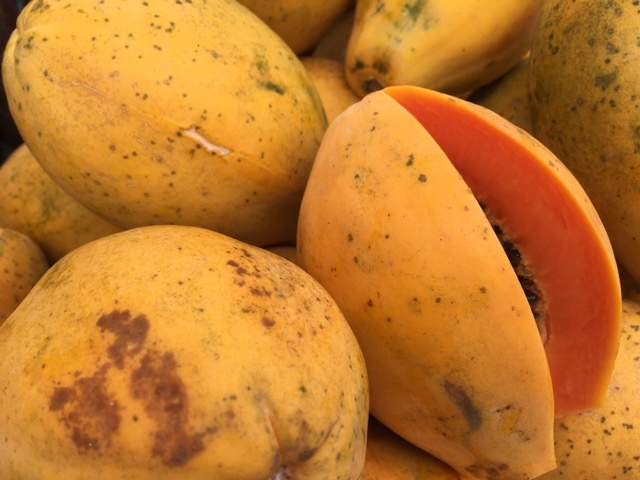 We’ve been going to the market for over three years now, and I can’t remember seeing such an abundance of fruits and vegetables, all of them freshly picked that morning. There really is something for everyone. 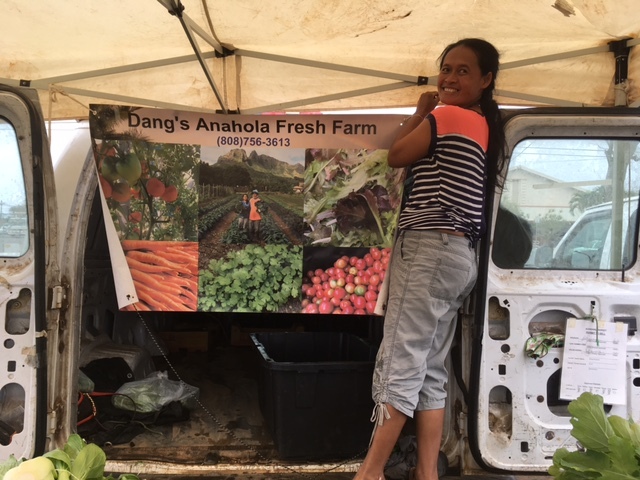 Our favorite produce stall is Dang’s Anahola Fresh Farm – we head there first every week, and buy most of our produce from them because of their great selection and prices. Although many farmers sell to restaurants and stores on the island, this family makes a good living selling at just three island markets during the week. Otherwise, they’re working on their farm. Hanging their farm sign before the market starts. The Dangs are from Thailand. 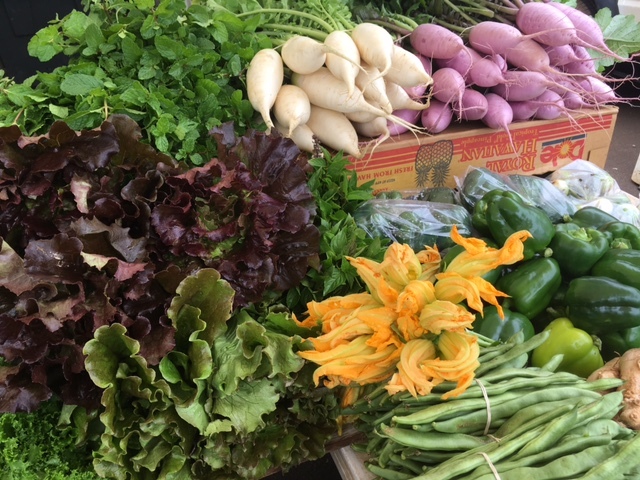 Some of Dang’s beautiful produce, including lettuces, zucchini blossoms, peppers, beans, fresh mint and daikon radishes. Finally, here’s what we bought yesterday. 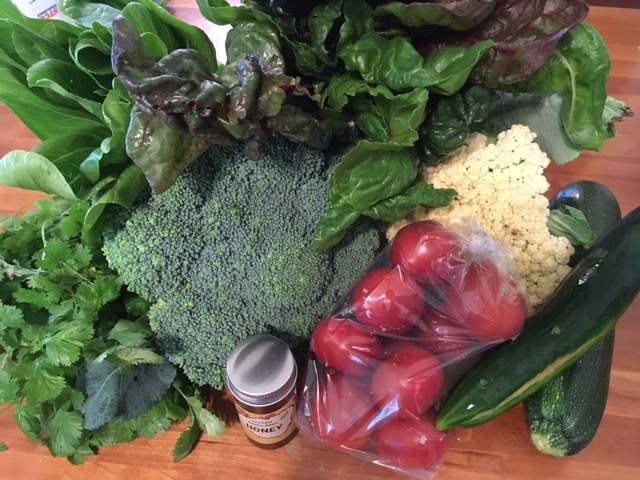 Can you guess how much we paid for all of this beautiful produce? Prices will be revealed on Sunday!